Available for $16.95 through Broadkill or Amazon. 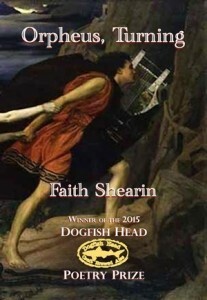 Winner of the thirteenth annual Dogfish Head Poetry Prize Book, Faith Shearin’s Orpheus, Turning takes that moment before Orpheus loses Eurydice a second and final time and applies it outward to mythologize her own life and act as a lens to interpret a broad array of both factual and speculative subject matter. Alongside historical and familial figures, dinosaurs, aliens, and Cain all seamlessly make an appearance at their own moments of truth. While narrative poetry is often the exploration of consequences—the recounting of a story to its climatic end—in Orpheus, Turning, each of Faith Shearin’s poems instead explore that pivotal moment that, once passed, cannot be reentered into nor undone, leaving the fallout to be sleuthed by the reader. Like the title poem, “Orpheus, Turning,” in which our narrator watches “grief returning to him instead of his wife:/his new companion,” the inhabitants of this collection seem unable to do anything but turn to bear witness, even though this act often becomes its own simple invitation of grief. towards the bedroom he did not want to leave. The narrator seems compelled to pull the memory into the present, immortalizing her brother in his young act of defiance. This is the sole depiction of her sibling—as if this painful childhood experience defines him. Why look back? In this case, because our narrator is obligated to do so in order to interpret her brother. beyond our dreams suddenly important. In the subsequent poem, “Hamelin Without the Rats,” the piper does not need to make an appearance in his own mythological narrative of medieval Hamelin to act as a harbinger of change. The point of turning has not come and gone with the disappearance of the children, but instead, there remains a hanging sense of dread, of a turning point yet unseen, but fast approaching. she intended to break too tiny to matter. Shearin’s placement of the poem in the collection says volumes—it is this first flight which sets Earhart’s route towards her inevitable final flight and disappearance, aviation her pied piper. Orpheus, Turning is Faith Shearin‘s fifth book (The Broadkill River Press, 2015). She is the recipient of awards from the Fine Arts Work Center, the National Endowment for the Arts, and the Barbara Deming Memorial Fund. 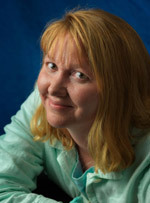 Her poems have appeared in Poetry East, Alaska Quarterly Review, The Autumn House Anthology of Contemporary American Poetry, and in Garrison Keillor’s Good Poems, American Places. She lives with her husband and daughter in a cabin on top of a mountain in West Virginia.